Bertha Ann Munn was a person with great skill as an educator. She taught all subjects to her thirty years of grade six classes in Wetaskiwin. However, most remember her for her ability to bring numbers alive in her teaching of mathematics. She was born in 1884 in Clifford, Ontario. Soon after she and her family moved to Albert. 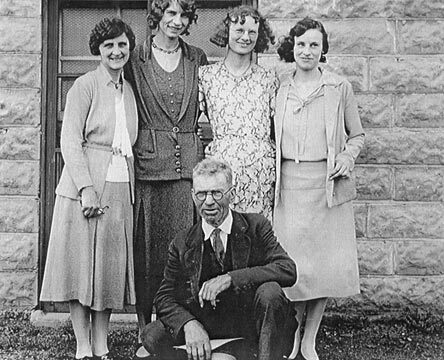 Her parents, Mr. and Mrs. Thomas Upton and eight siblings lived on a farm west of Pincher Creek. For her high school, Bertha went to Calgary and proceeded to become a teacher by attending Normal School in Regina. She taught in country schools in southern Alberta before marrying a railroader, James Alexander Munn, in September 1907. They lived in Calgary, where their two sons, James and Clifford, were born, until 1911. They then moved to Wetaskiwin, where they lived until Bertha moved to a nursing home in Edmonton and passed away there in 1980. After her sons were old enough to go to school, Bertha began teaching again. She taught grade six in the King Edward School and continued for thirty years. Even after her retirement at age sixty-seven, she continued to substitute teach and then tutored in math in her home well into her eighties. She was a strict disciplinarian. If her students had not done their homework, it meant after school for them. Even some corporal punishment was meted out if necessary. In spite of this she was a kind and considerate teacher, helping her students to master their studies and bundling them up in the cold. All teachers and students walked home for their noon lunch and Bertha had almost a mile to walk. Perhaps that is why she remained so slim throughout her lifetime. Bertha seemed to love entertaining and often had the school staff to her house for socials and cards, as well as her church groups and Red Cross meetings. Her home was open at school festival time for the children to come and practise. Their home was interesting in that it was the first pre-built modular home in Wetaskiwin. It is still on the same corner today. Her legacy lies in the children that benefited from her instruction and her ability to teach the mathematical concepts to the youth of the time. Many of Wetaskiwin's seniors today can attest to her great teaching as they went through the school system.